Humble Bee Farm, Flixton, Scarborough, YO11 3UJ. 01723 890437. 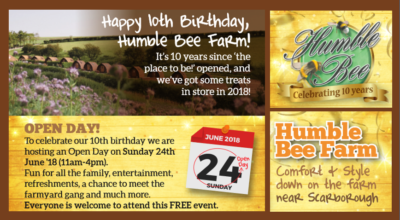 Humble Bee Farm is having an Open Day on Sunday 24th June, 11am-4pm, which will raise funds for the Yorkshire Air Ambulance. This family-run business, which is a glamping site based on a working farm just outside Flixton village, is to celebrate it’s 10th anniversary. Everyone is welcome to attend this free event. “We’ve got a wide range of stalls attending including one offering temporary glitter tattoos and another selling artisan gin, so there will be something for everyone. “Farmer Percy will be demonstrating his farming skills and we’ve also got traditional sheep shearing, nature events, a bouncy castle and local ice cream for sale. “Families will also get the chance to see our glamping accommodation looking its best and can take part in our new Nature Trail.